Good morning fellow nail fanatics! This morning I have a very special manicure to show you. I wanted to do something eyeball related as a Halloween manicure, but I have seen a lot of eyeball manis lately and I had to make sure that mine was different (you know, because I'm a contrarian). So I came up with this pattern design that has a huge wow factor but really is not very difficult to execute well! And THEN, I wrote you guys a tutorial cause I LURRRRVE you all! Except, I didn't have any photos of the process to go along with it. What to do? Whitney from We're Making History suggested that I make some diagrams to go along with the tutorial. I thought that was a brilliant idea so I spent some time in Photoshop putting together some graphics for you guys. First things first, let's see the mani that we will be working towards today! Apply your basecoat to your nails. Let it dry. Apply the burgundy color or whatever color you want to use for the background to your full nails. Add big white dots to the nail by dotting them on using the polish's brush. If the polish you are using has a flat brush like OPI's, you may want to apply your white with a large dotting tool or nail art brush. I found that these dots look best if you apply them so that there are white dots partially off the sides of the nail, to keep the pattern looking infinite. It's okay if you get white on your fingers or cuticles, we will clean this up later. 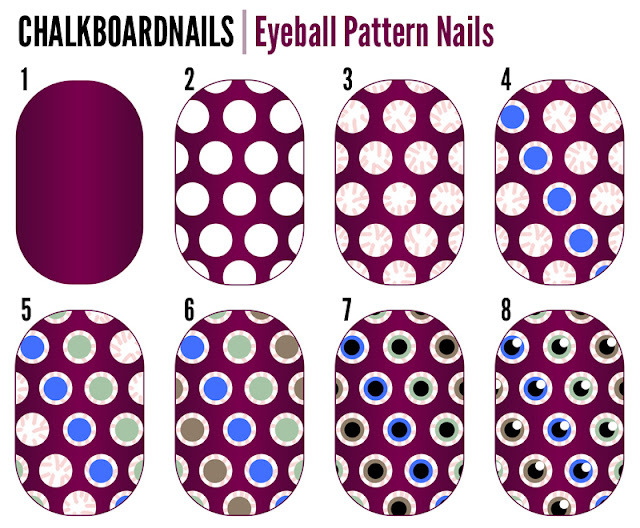 Using a small nail art brush, paint on some eyeball veins with your red jelly or sheer red polish. There is a lot going on in this mani so the sheer-factor keeps the red from being too distracting. Use the large end of your dotting tool to apply dots of your first eye color in the middle of the white dots. I like to put a few drops of polish on to a piece of wax paper and dip the dotting tool into that. Again, it's fine if you get the colored polish on your fingers or cuticles when you are doing the eyes on the edges of your nails. Repeat step four with your second eye color. Repeat step four with your third eye color. Use the small end of your dotting tool to apply the black pupils of the eyeballs in the middle of the colored dots. Use a light touch when applying so the black doesn't spread too wide and cover your colors. Use a tiny dotting tool or a toothpick to apply the white highlights to the eyes (optional). Don't center them in the black; instead, place them at the top right of the black and colored dots. See visual for placement clarification. Clean up the extra polish on your fingers and cuticles. I like to use a makeup brush dipped in pure acetone. Let your nails dry for a bit, and apply your topcoat of choice to seal and protect the look. See, not too hard, right? It's mostly just applying a bunch of dots! Here are some more pics of my nails with this super cool mani on them. First-what happened to my pretty brown background??? I just happen to love green as much as brown-so I'm adjusting-I love that Connect the Dots polish in your banner! eek! i think i'd be frightened to look down and see that many eyes watching me! a very neat idea though! Oh wow, this is an awesome tutorial! I don't know if I could be this good, but I might try this for Halloween! I love this! It's like you crawled into my brain and plucked this one out, I totally wanted to do something like this, thanks for the tutorial! This looks just AWESOME!! One of the coolest Halloween manis!! Oh my, that's a whole lot of eyeballs! It's amazing though! & Thanks for the tutorial, I'm going to try this for my next mani! :) Hopefully I don't fail, lol. Awesome job..and that you for the tutorial. These are ones I might actually try! these look amazzzzzing!!! thanks for the step by step tutorial!!! I love your blog! I love your tutorial!!! It was very easy to follow, thanks! Very cool mani and wonderful tutorial!!!! That is all kinds of amazing! I love this manicure, it's freaky and fantastic! I also love your detailed tutorial, it looks like you spent a ton of time on it! How'd you do the pattern picture? Super awesome! Great post! Love the tutorial! @Mimi - Thanks, I did put some time into it, but it was a labor of love! I made the graphics by hand in Photoshop. So creepy I love it! Thanks for the walk-through! @Sonoma Benta, Pauline - both of your manis look fabulous! I like this design as an accent nail a lot! hey :-) your blog is awesome!!! your pictures are so beautiful, I just love it! I love your tutorial!! I took a try at it on an alien manicure I did. They're not as perfect as yours but oh well..
@Kirshten - that looks fantastic! I love the way you used them! Thanks for joining my Link Party! @I Drink Nail Polish - Thank you!! Wow, I know I'm really late in commenting, but this looks incredible! I'm definitely gonna try this. Bookmarking this page now! Hi - long time reader, first time commenter! I just love this look - it's creepy yet cute all at once - and the tutorial is super clear and fun too, so thank you so much for making it!